A fraud and an unfortunate response. 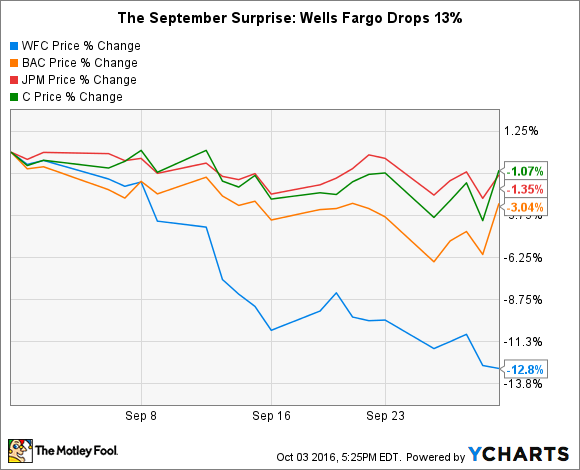 September was a month to forget for Wells Fargo (NYSE:WFC). After it was revealed on Sept. 8 that the bank had opened as many as 2 million fake accounts for customers, shares of Wells Fargo began a descent that's still under way, culminating in a 13% drop last month. It initially seemed as if the issue would be more of a tempest in a teapot as opposed to a substantive problem for the nation's third-biggest bank by assets. I say that because the fine that Wells Fargo had to pay regulators for its misdeeds amounted to only $185 million. That's a lot of money, but for Wells Fargo, it equates to less than 4% of its quarterly earnings. In the three months ended June 30, for instance, the bank earned $5.6 billion. A couple hundred million dollars is just a drop in the bucket compared to this. However, the size of the fine belies the magnitude of damage done to Wells Fargo's reputation. Every day over the past three weeks, the media has been filled with reports that make Wells Fargo look even worse. The most damning information that's come to light concerns allegations that whistle-blowers at the bank were fired for reporting the fraud sooner. All told, 5,300 people lost their jobs, though presumably only a small fraction of them were whistle-blowers. The appearance on Capital Hill of Wells Fargo chairman and CEO John Stumpf only made things worse. Called to testify before the Senate and House banking committees, Stumpf was pilloried by lawmakers. Senators and representatives were furious not only over the fraud itself, but also over the way Stumpf blamed the bank's low-level employees for it and defended the executive in charge of the unit where it occurred over a five-year period -- and perhaps longer -- from 2011 to 2015. Does this change the investing thesis? Despite all this, one could argue, as I have, that the thesis underlying Wells Fargo's stock hasn't materially changed. It's still one of the most efficient and profitable banks in the country. And it's still one of the best when it comes to managing credit risk, the most important responsibility of a bank. Additionally, while the headlines have been horrible for Wells Fargo, there was no reason to believe that its retail customers -- those impacted by the scam -- would leave the bank. Betrayal of trust aside, previous studies have shown that changing banks is such a hassle that most people will avoid doing so. But this argument doesn't apply with equal force to larger, commercial customers. Both the States of California and Illinois have, at least temporarily, severed certain ties with Wells Fargo. For its part, Illinois has suspended investments in Wells Fargo debt securities and stopped using the bank as a broker/dealer for investment purchases for one year, according to The Wall Street Journal. This is an issue that investors should watch closely. They should also watch to see what happens with the litany of public and private lawsuits that have already been initiated in response to the fraud. These should be easily absorbed by Wells Fargo's massive earnings, but taken together with further customer defections, the situation could continue to deteriorate for the bank.